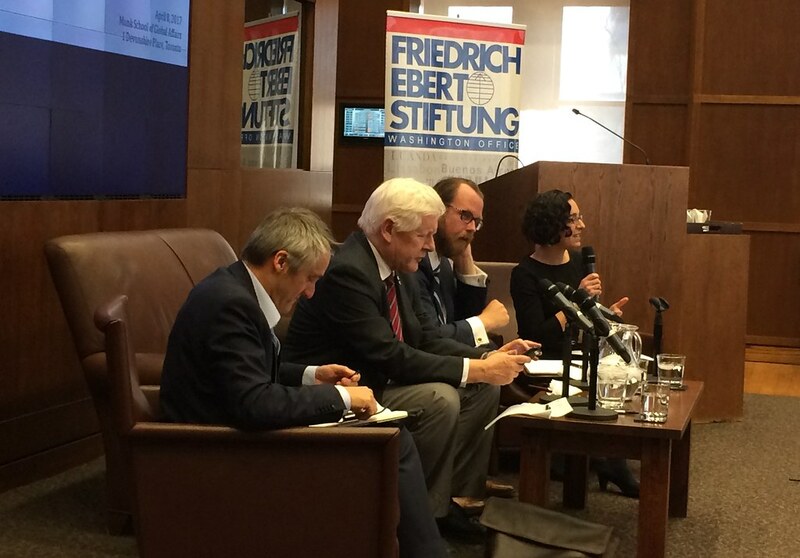 The first panel – a discussion about Germany’s federal election in September – was moderated by Veit Medick and the panelists included Dagmar Freitag, Prof. Eric Langenbacher and Dr. Michael Petrou. Some of the opinions which stood out to me were that Canada has been smug in terms of its approach to refugees and that Canadians have been very sheltered; Germany is facing challenges of migration on a scale that Canada isn’t. 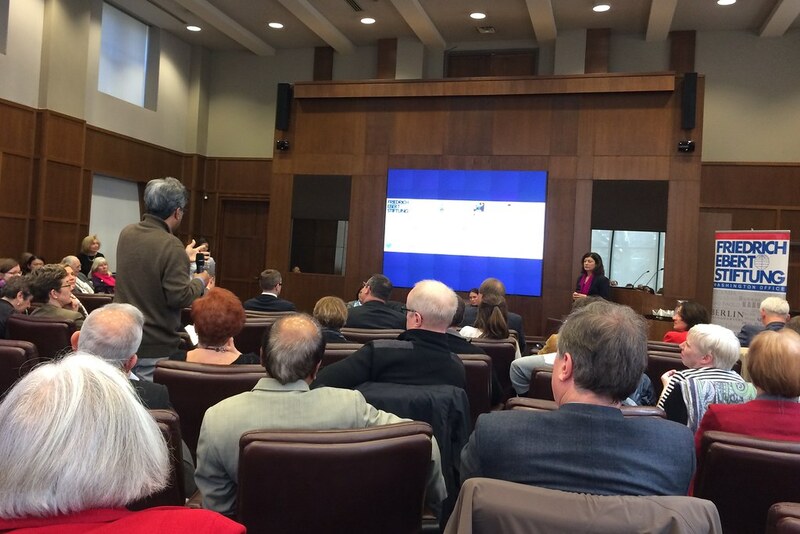 An audience member asks a question during the second panel discussion. The second panel talk was about immigration in Canada and Germany. The panelists were Birte Steller, Nele Allenberg and Prof. Jeffrey G. Reitz. The moderator was Marina Jiminez. There were quite a few points and facts highlighted during this talk that I found interesting: Germany’s recent ‘immigration crisis’ was actually an administration crisis and if this had happened in Canada, Canadians wouldn’t have necessarily reacted positively. This is because even though Canada is known for taking in large numbers of immigrants each year, these immigrants are vetted for employability. Moreover, (unlike Canadians) the German public hasn’t been sold on the idea that refugees can actually bring economic benefit to a country. Germany was also very strict in terms of immigration prior to 2005. The third and final panel: (L-R) Prof. Frank Decker, Bob Rae, Ryan Lenz and moderator Joanna Slater. Populism in Europe and North America was the theme discussed during the final panel. One notion which really surprised me during this talk was the belief that populism had already come to Canada. Germany’s continuous issue with its Nazi legacy – a topic very dear to my heart – was another point brought up to partly account for the lack of tolerance of right-wing extremism amongst Germans. University of Toronto’s Prof. Randall Hansen concluded the conference by stating that Canada and Germany both have leaders who are committed to liberal values, and that these values must be defended. Check out #GermanTO on Twitter to view the full conversation.